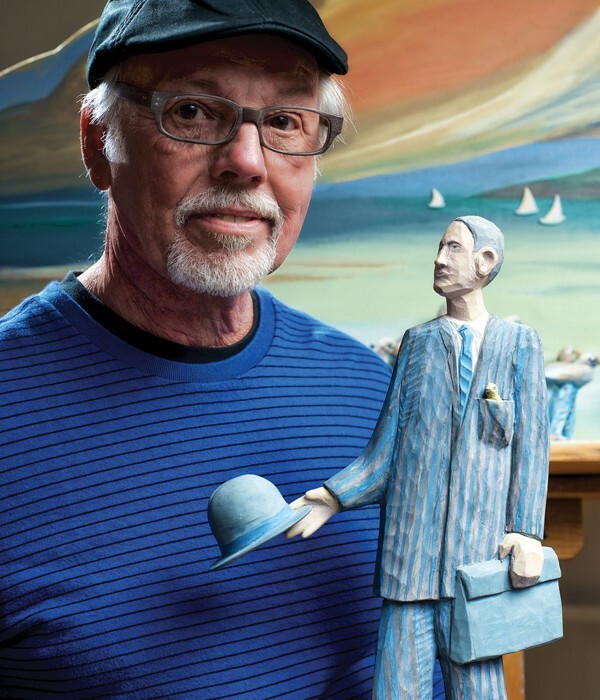 Stan Peterson is a self-taught woodcarver who has been exhibiting his art in Portland since the 1980s, starting in what is now the Pearl District but when the area looked more like Southeast Industrial does today and the smell of wort from Henry Weinhard’s brewery still wafted through the streets. He’s had a show in Portland every 18 months since. Besides Portland, Peterson’s work has been exhibited throughout California, Texas, New Mexico, in New York City, Paris and elsewhere. 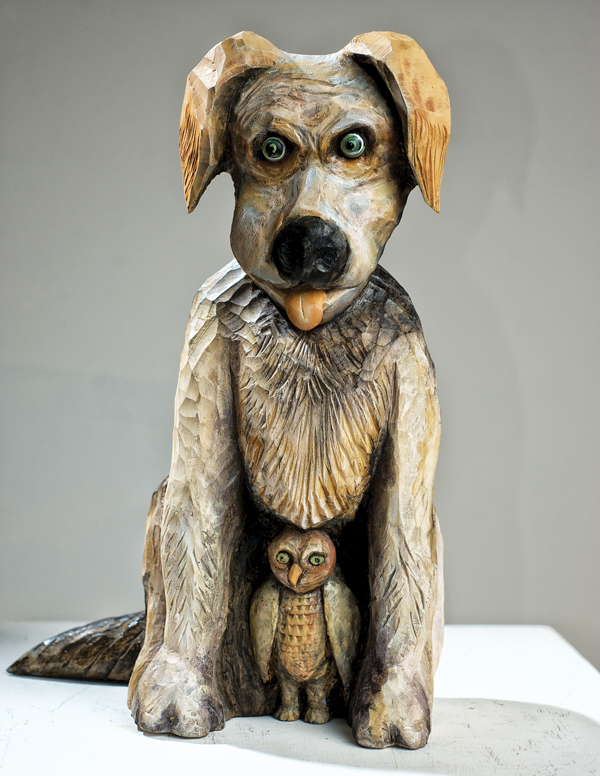 His latest show was at Mark Woolley Gallery in March where Peterson displayed many, but not all of his pieces. 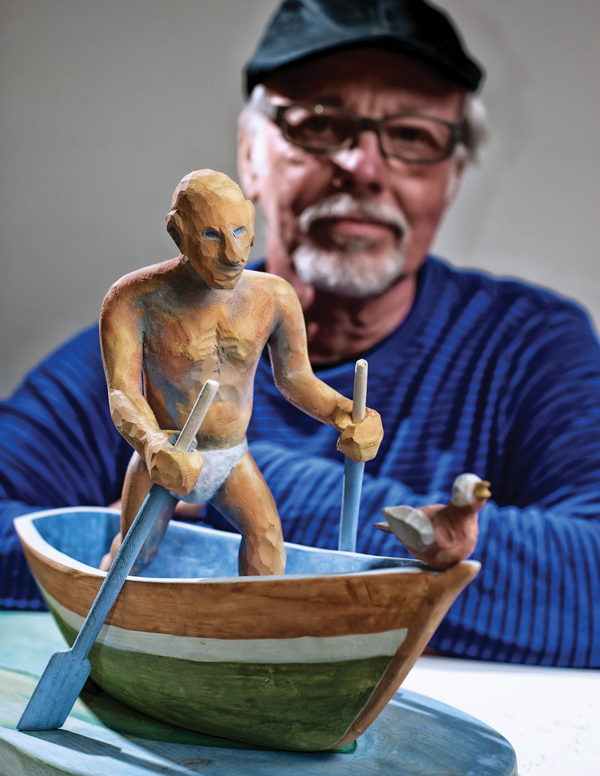 Along with covering his and Stephanie Wiarda’s Little Art in the Trailer, PDX Magazine was able to photograph many of Peterson’s works inside his studio, some of which were still in progress for upcoming shows and others that rarely leave his studio. “Watchdog” by Stan Peterson. Carved and painted basswood. “Rescue Dogs” in the works. 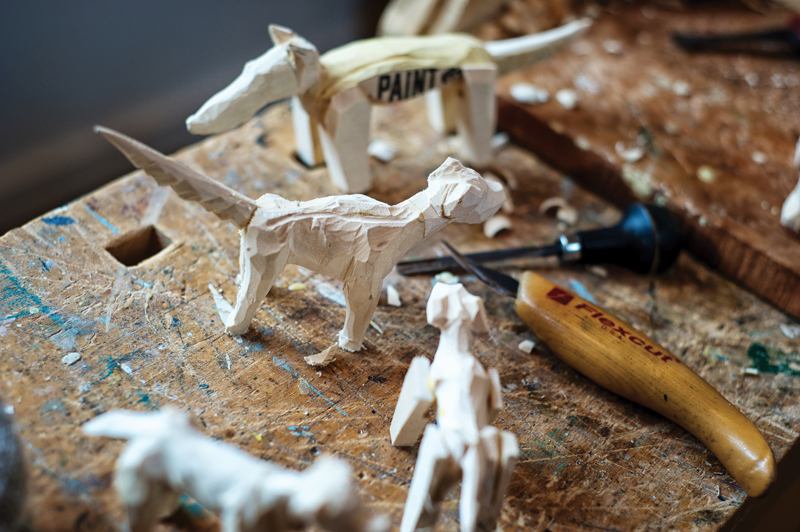 These figures are made from scraps in Peterson’s studio. The idea is to carve dogs small enough that they can fit in one’s hand. 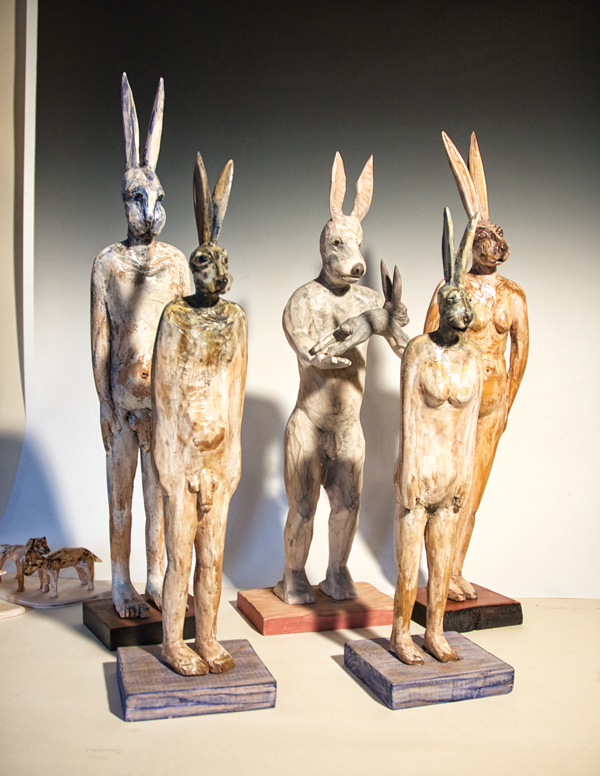 From Peterson’s collection “Naked Rabbitmen.” These pieces are from a series of human-like rabbits Peterson has carved over the years. Photo by Ross Blanchard. 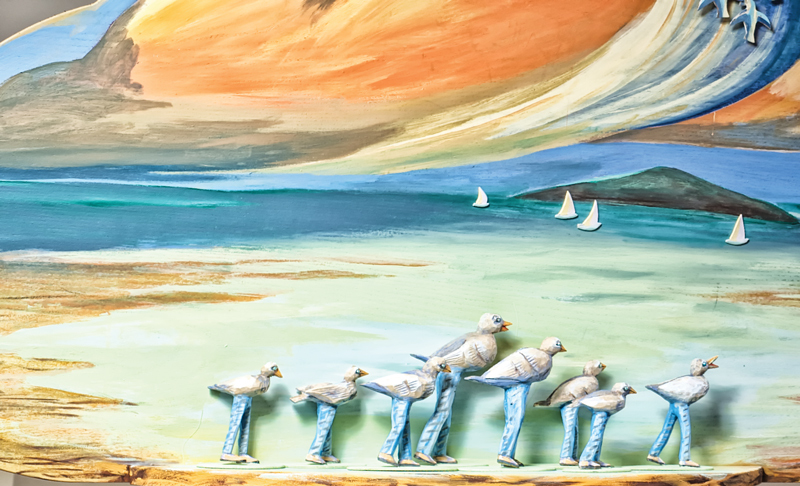 “The Zebra Finch Journey” by Stan Peteroson. Carved wood with painted background. This work is slated for an upcoming exhibit. “Rower on the Riviera” by Stan Peterson. 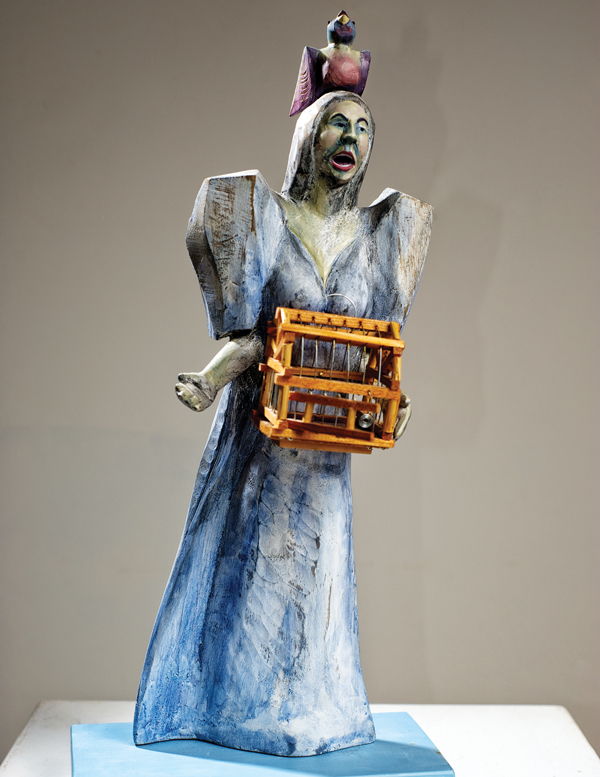 “Bel Canto.” Peterson uses milk paint on his carvings which was used in Shaker furniture. He sands the resulting dullish finish to reveal some of the wood beneath and to brighten the figure. 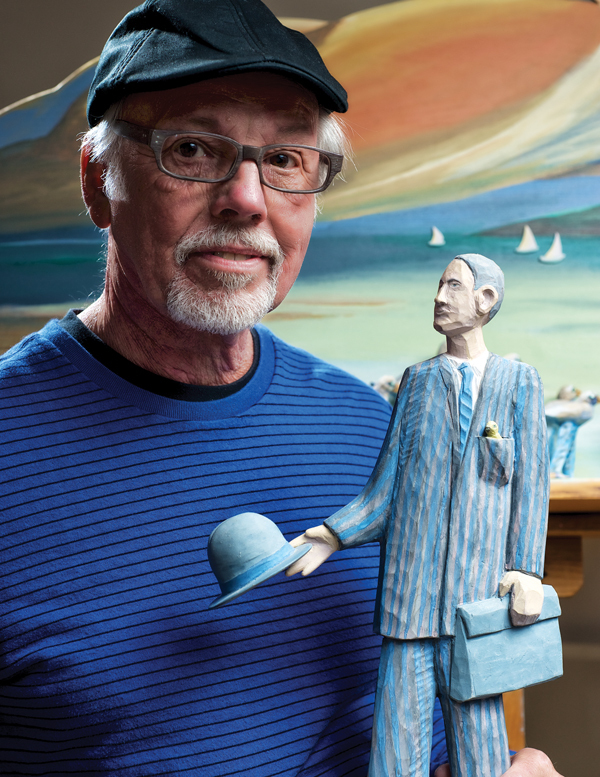 Stan Peterson with “The Visitor.” Peterson carved this piece after a trip to Paris where he visited the Parisian bird market. The figure is a signature piece of his he features on his business cards and he made clear is not for sale. The sculpture depicts a man on his lunch hour from work who has bought a canary that rests in his pocket. Find more of Peterson’s work and information about upcoming exhibits on his website www.Stan-Peterson.com.